Hi there! 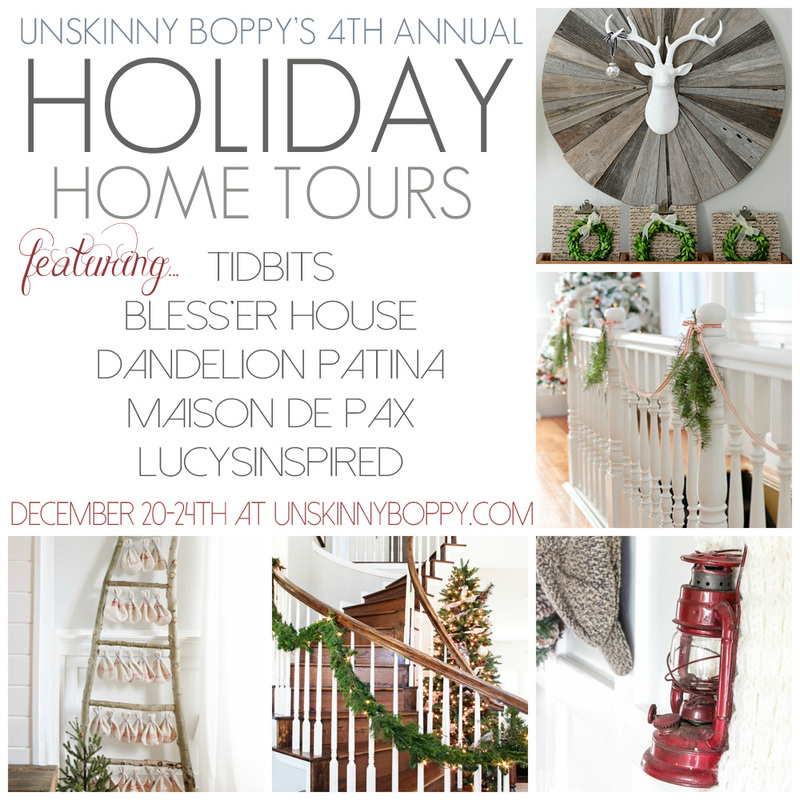 I’m Lauren from Bless’er House, and I’m completely giddy that Beth invited me over for a holiday show and tell. 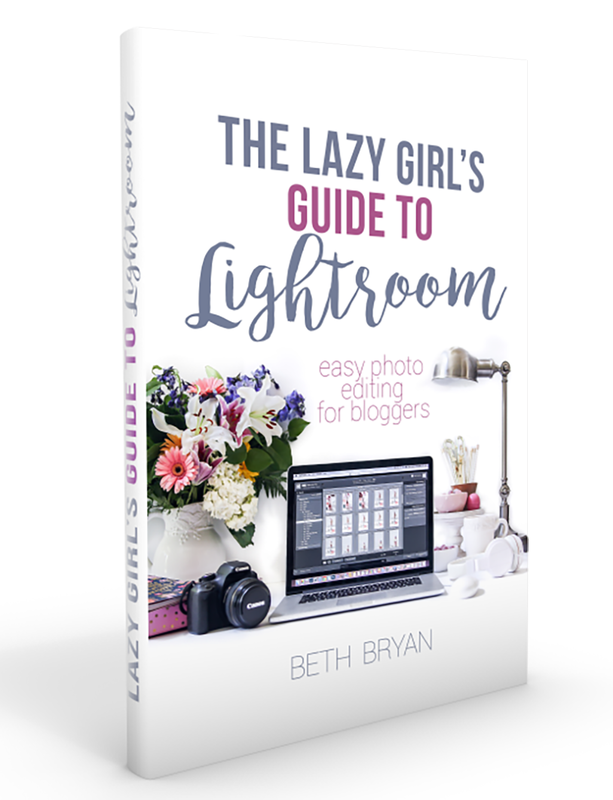 I’ve been an admirer of Beth’s blog from afar since before I started my own home decor blog two years ago, so it really is a dream come true to be here. Welcome to my little slice of heaven here in the suburbs of Charlotte, North Carolina! My husband, daughter, and I have had so many great adventures in this first house of ours since we moved in exactly two years ago. 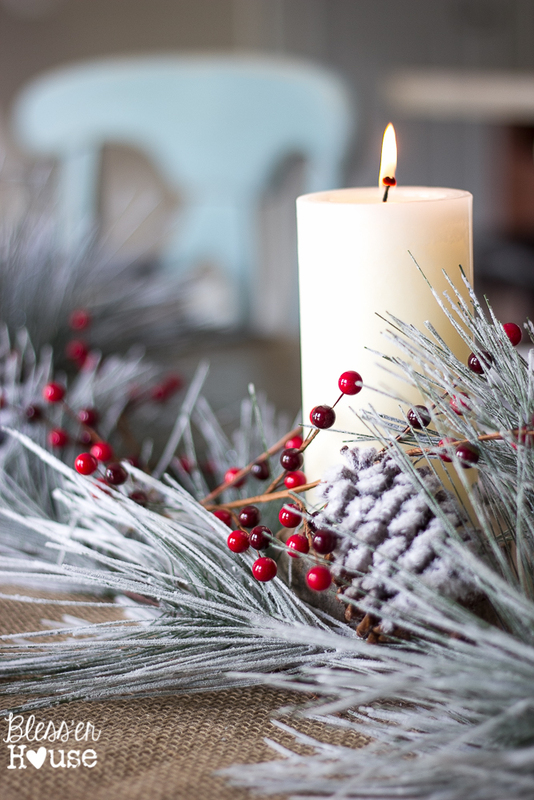 Christmas is an extra special celebration because of that. 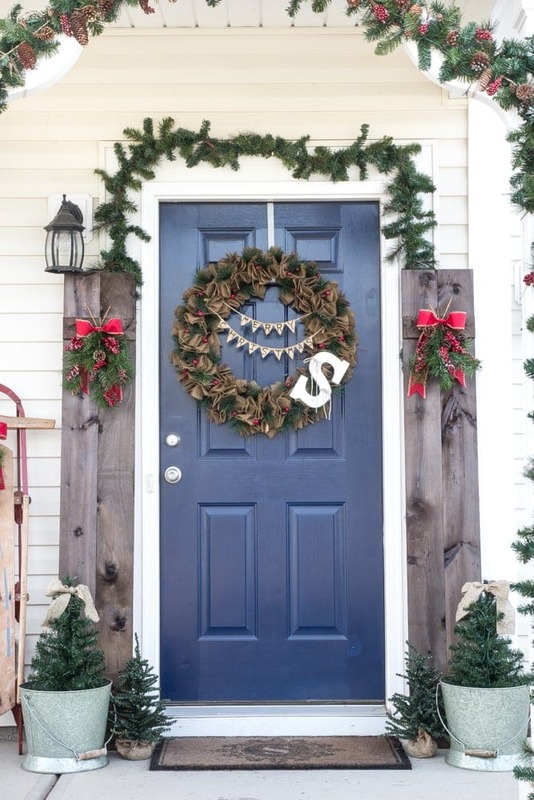 We live in a neighborhood that doesn’t give us much wiggle room for making changes to the exterior of our house, but we don’t let that hold us back from making it our own. These simple shutters my husband and I put together a few months ago let us have fun with the rustic style we love so much. Our house is a stock builder home, so it gave us a nice blank canvas to work with in the beginning. 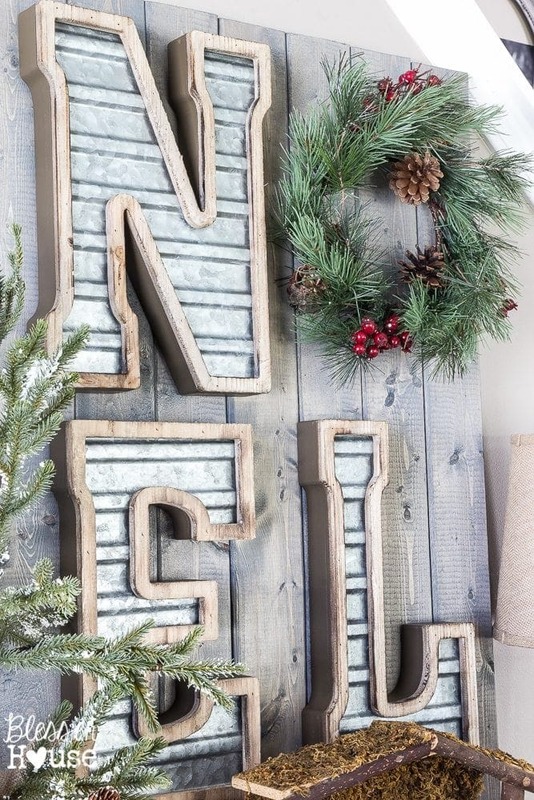 We love incorporating touches of a farmhouse look here and there. 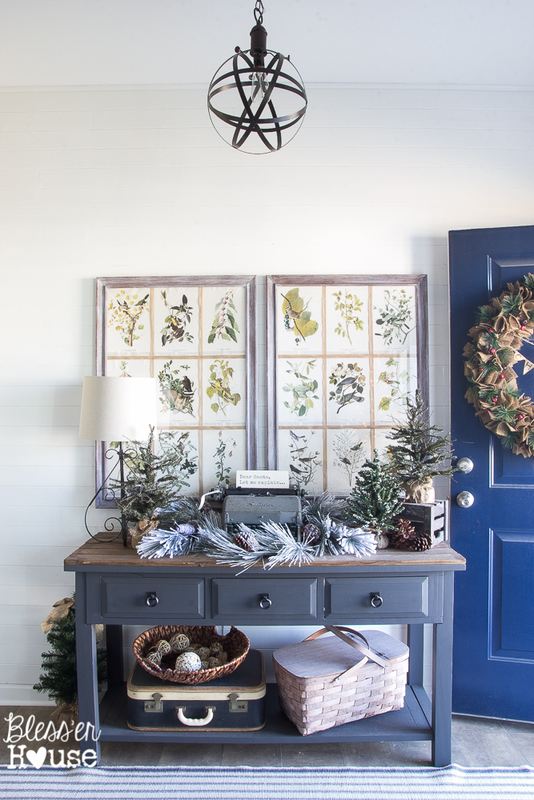 I’m now officially addicted to white planked walls since we gave our foyer a makeover this summer. 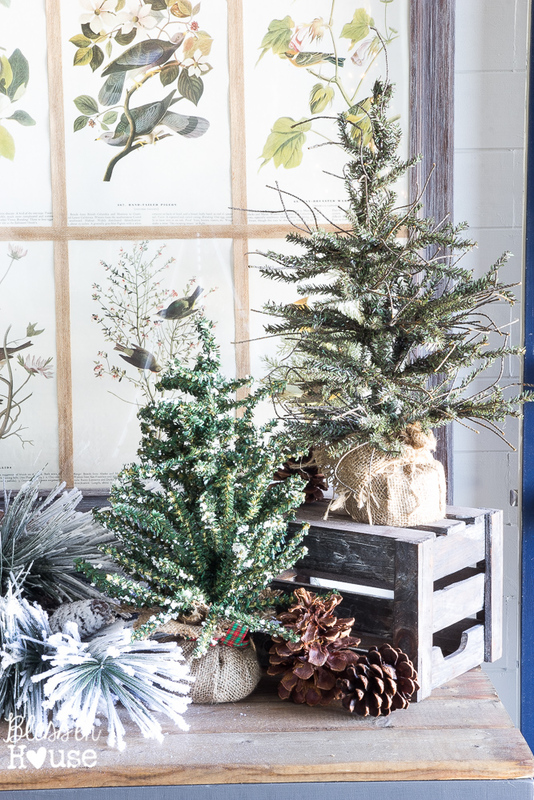 A few mini twig trees was all this space really needed to make it festive for winter. 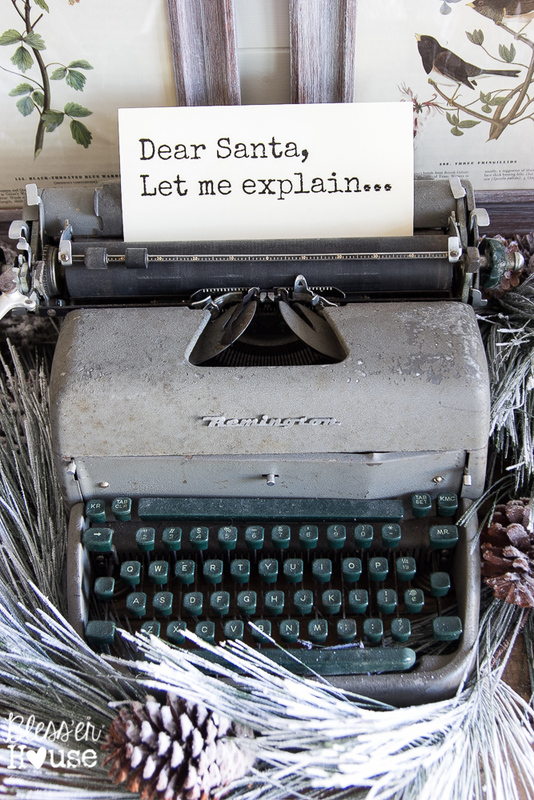 Oh and of course a little needed explanation to Santa on our typewriter. You can spin around and check out our dining room behind you. 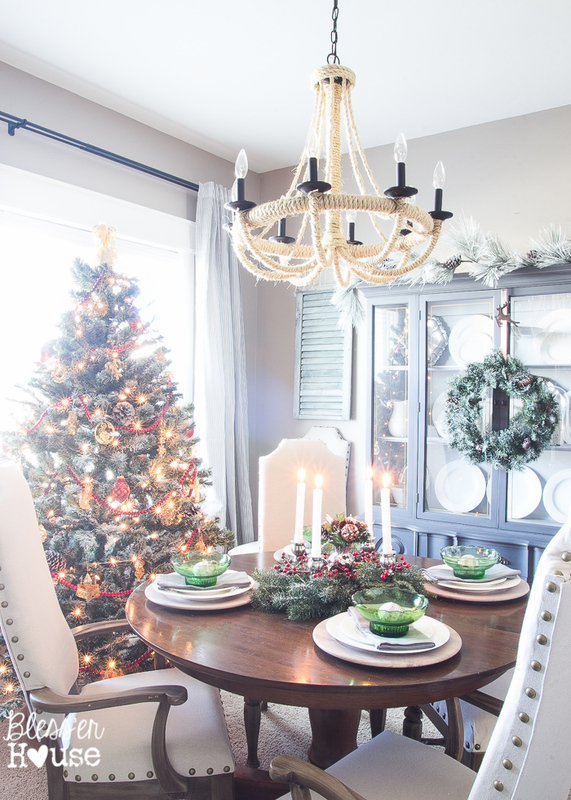 This space is one of those rarely used rooms except for this time of year when we have several special dinners for family gatherings. I’ve used nothing but Craigslist and flea market finds in here, and I’m pretty amazed how it’s all come together. That Christmas tree in our window belonged to my grandmother, and I’m so thankful to have that sweet hand-me-down. 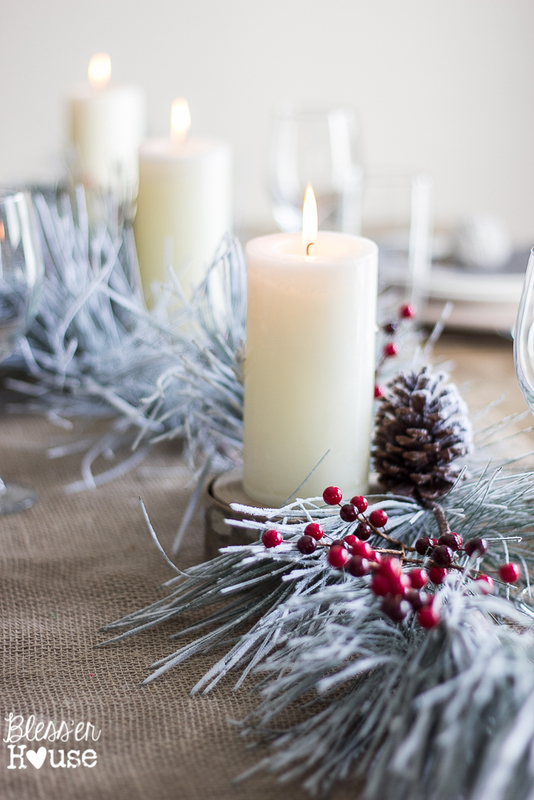 While I was decorating our tree, I dumped a strand of garland on the table and plopped an old silver candelabra on top to get them out of the way. 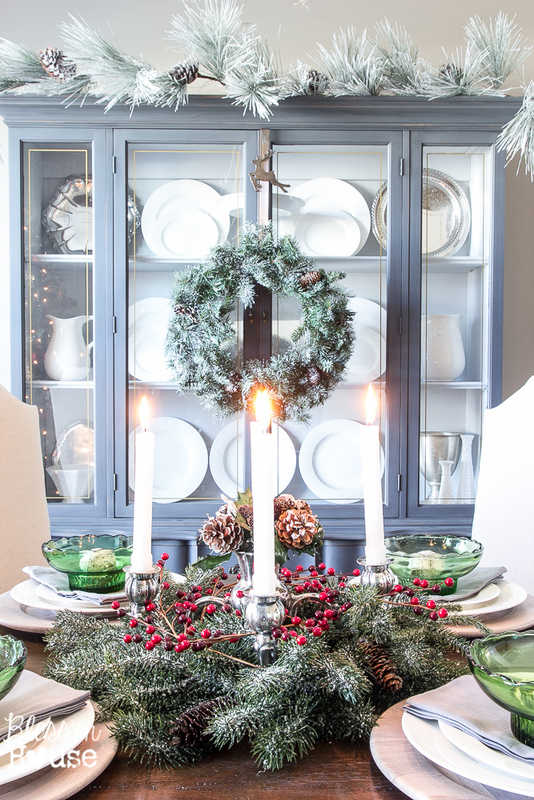 Lo and behold, it became the perfect centerpiece that reminds me so much of St. Lucia Day. It’s happy accidents like that that make me feel like my grandmother is saying hello. Her side of the family was Swedish, and she always seems to show up in some way this time of year. 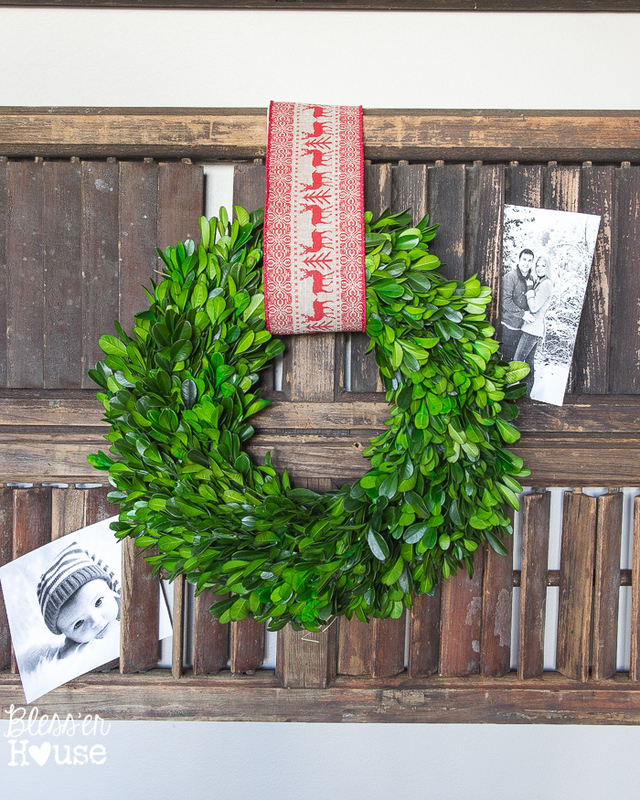 On our dining room wall, I hung up some old shutters with boxwood wreaths. 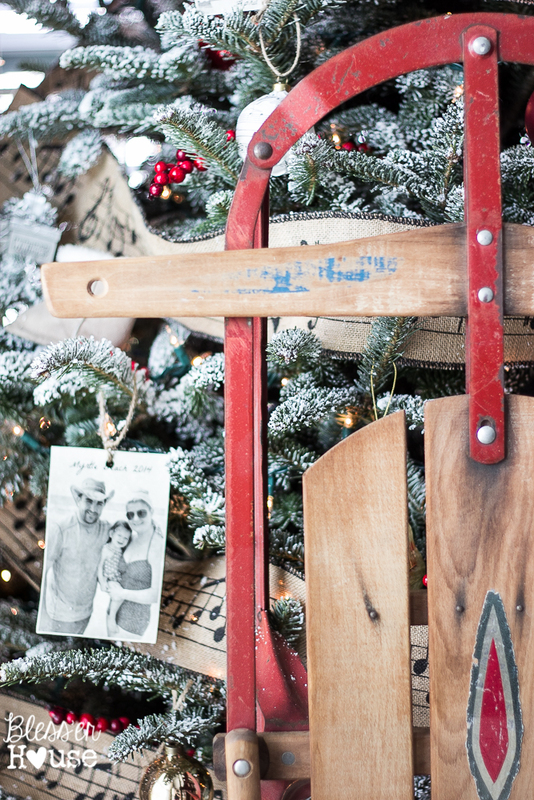 It’s become my favorite spot to hold Christmas photos and holiday cards from friends and family. 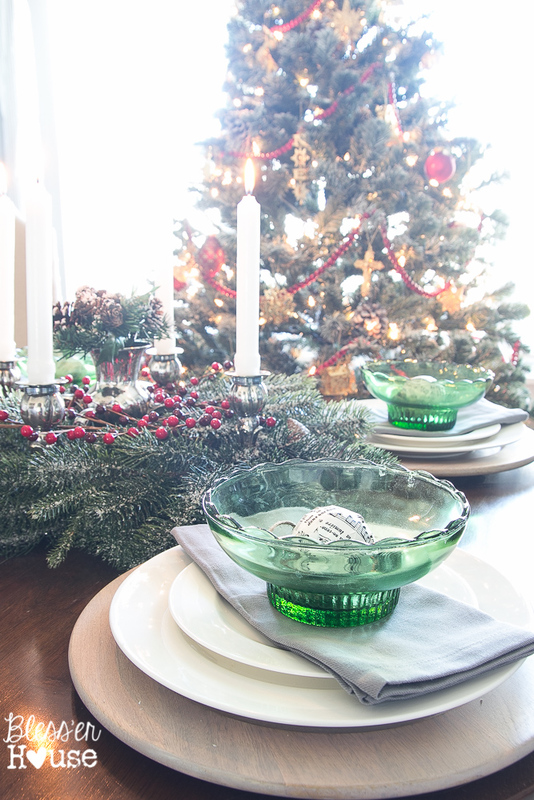 My grandmother’s green depression glass worked perfectly on our table too. I’m always fascinated by its history. Down our hallway is this window I pulled out of my in-laws’ barn. This window once hung in my husband’s childhood home that was built in 1904. 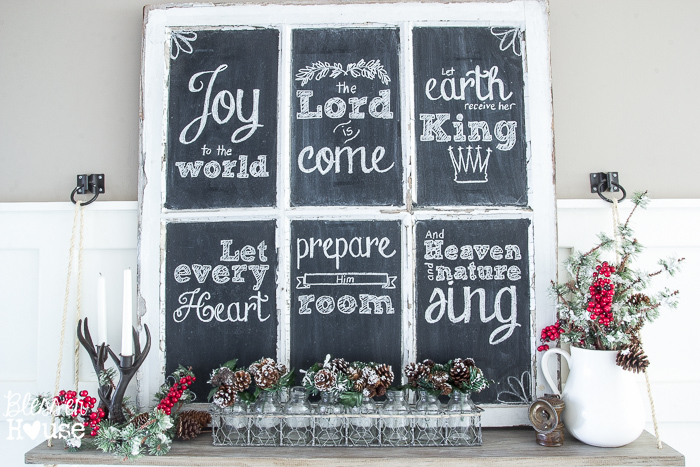 I painted the glass with some chalkboard paint, and I like to change out the quotes and scriptures with the seasons. 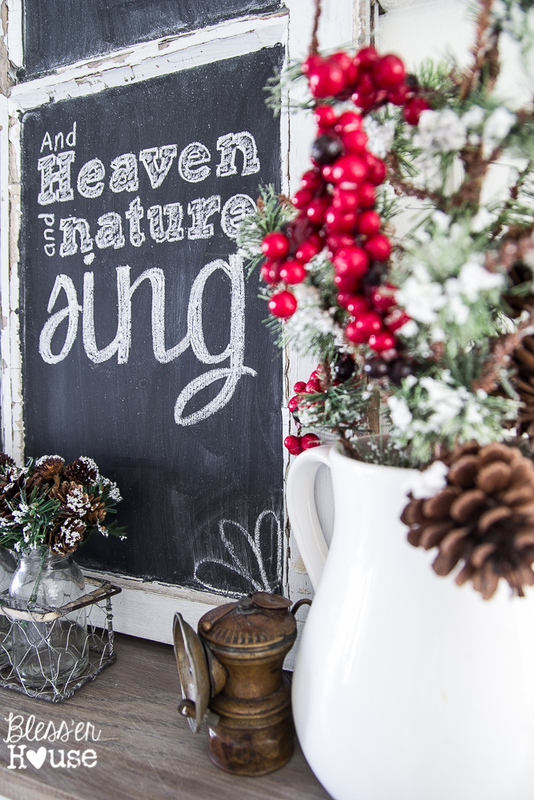 Across from the chalkboard window is this makeshift entryway of ours. I found that wagon bench for $35 on Craigslist last year, and then my husband and I installed the board and batten this summer to brighten up this otherwise dark space. It normally looks a hot mess with shoes and coats thrown everywhere, but I cleaned it up for y’all. Ha! Our daughter looks forward to opening a bag on her advent calendar every morning too. It’s the first thing she says every day when she wakes up. 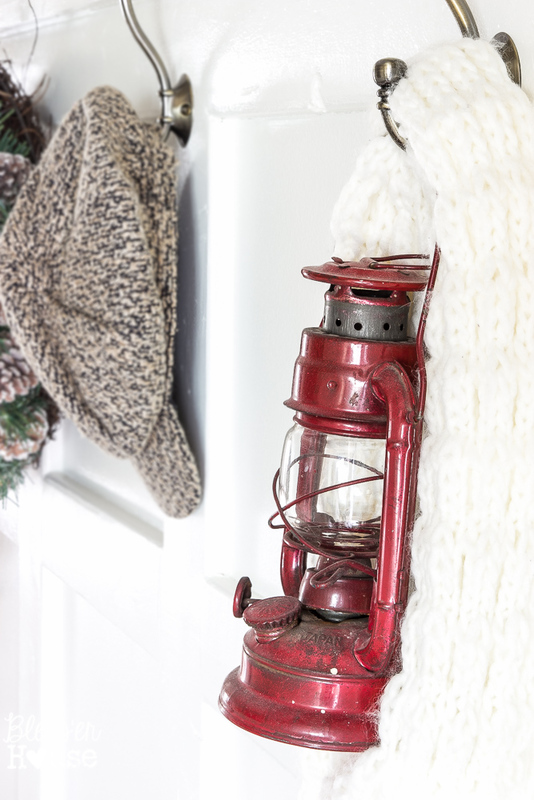 On down the hallway is our stairway that opens up into our living room. 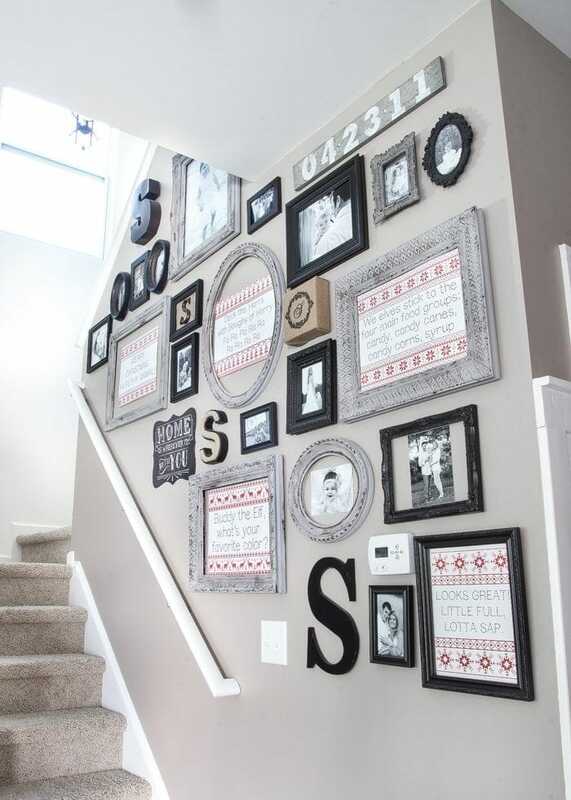 This gallery wall was one of my first DIYs ever and is still one of my favorite spots in our house. It seems appropriate that it’s on the center wall in our home and is very much the heart of it too. It holds our favorite pictures of our family over the years. 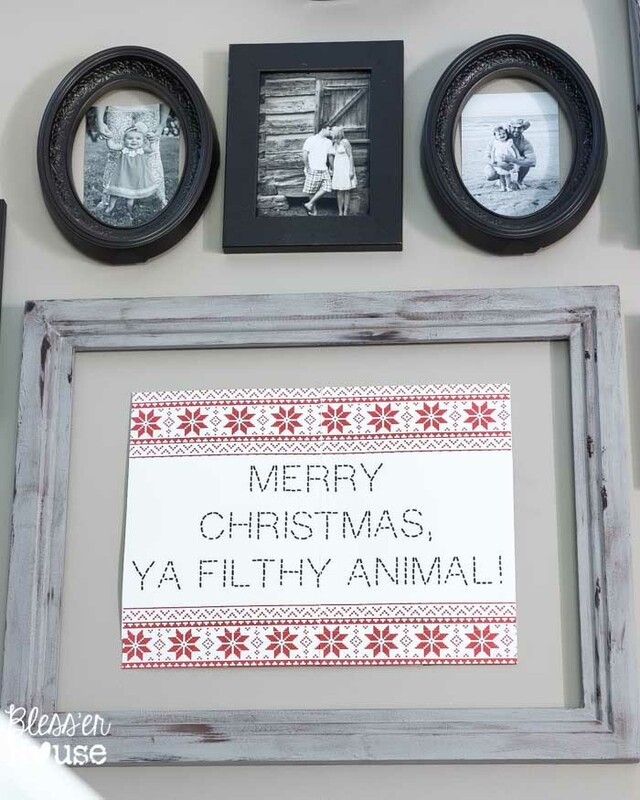 But of course, I had to give it some festive printables to get in on the Christmas fun. 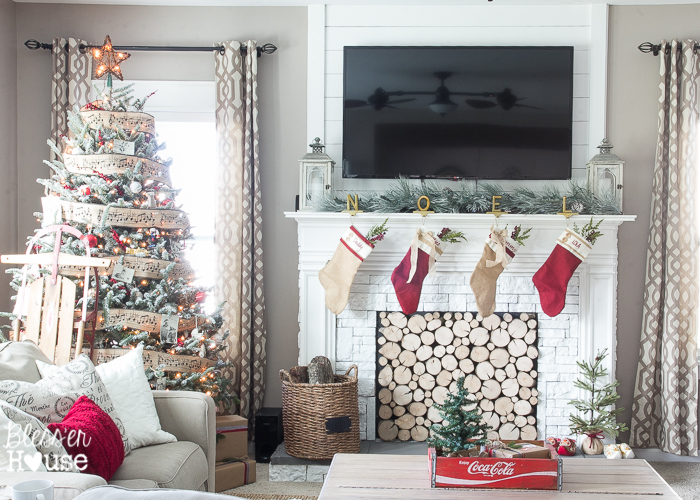 We have a slight Christmas movie obsession around here. 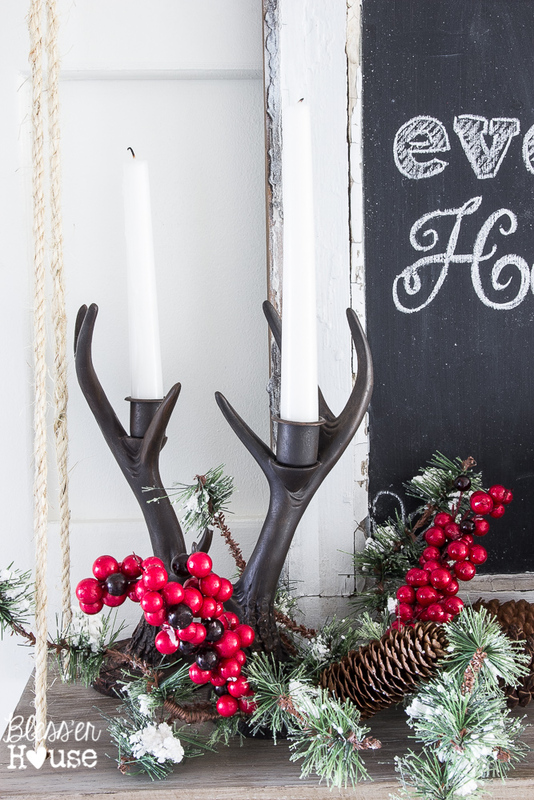 If anyone tells you to stop quoting Christmas movies, stop talking to them. No one needs that kind of negativity in their life. 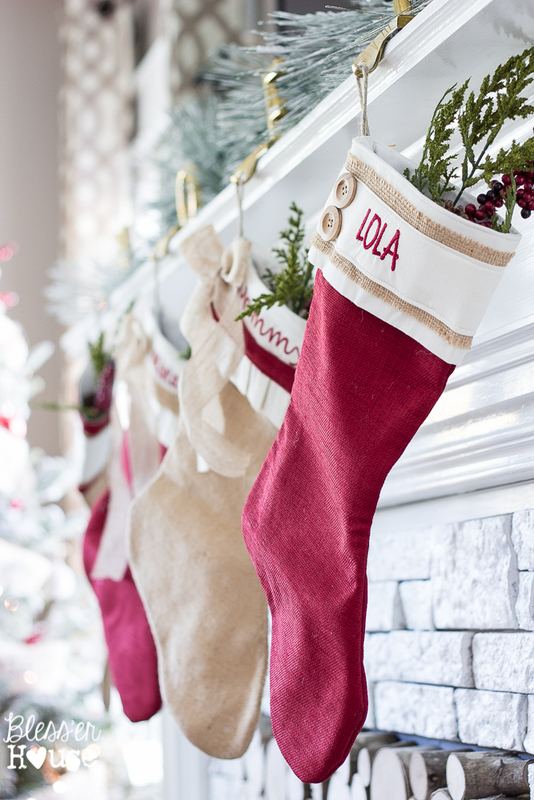 We’ve hung our burlap stockings by our (faux) chimney with care. 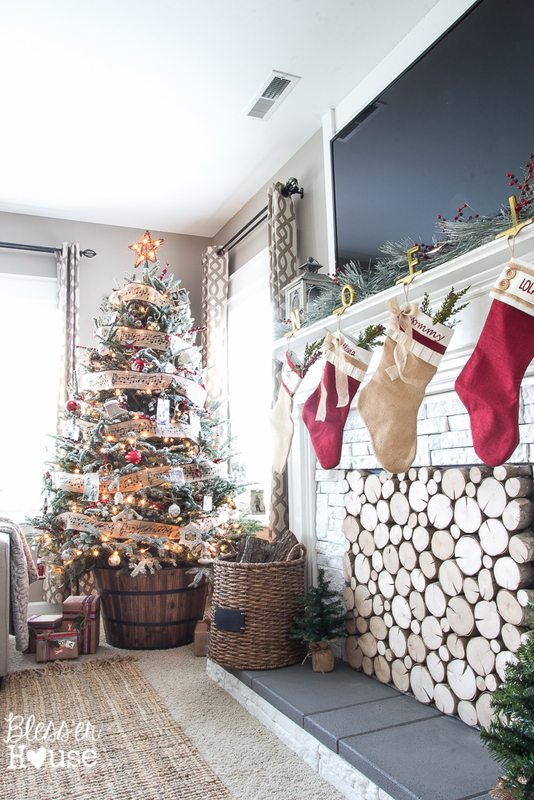 Although, Santa is going to need a lot of help climbing out of our faux fireplace, I think. I say this every year, but this is my favorite Christmas tree we’ve ever had! 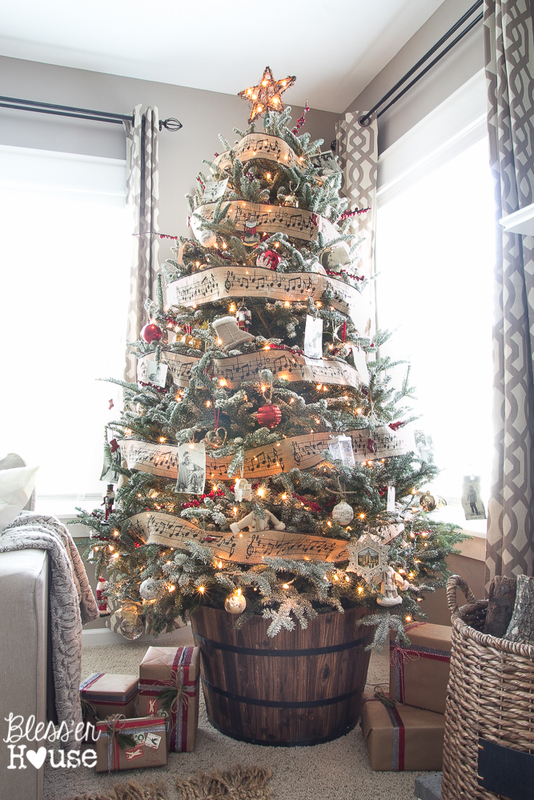 We always buy a real one off the lot, and we decided to use a wooden barrel instead of a tree skirt this year. I’m sensing a new tradition with this one. We used a couple of cans of spray snow to fake flock it too. It makes everything extra magical. 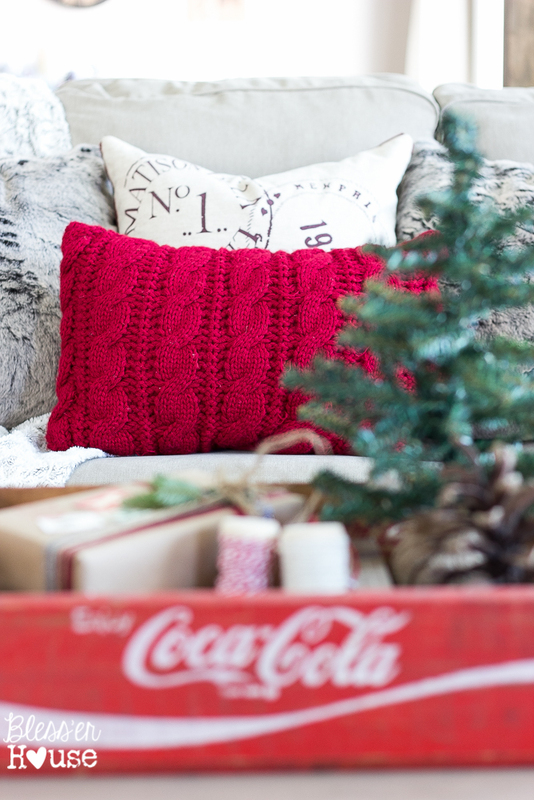 I found this Coca-Cola crate at the thrift store last summer, and I love sticking it on our coffee table as a catch-all this time of year. 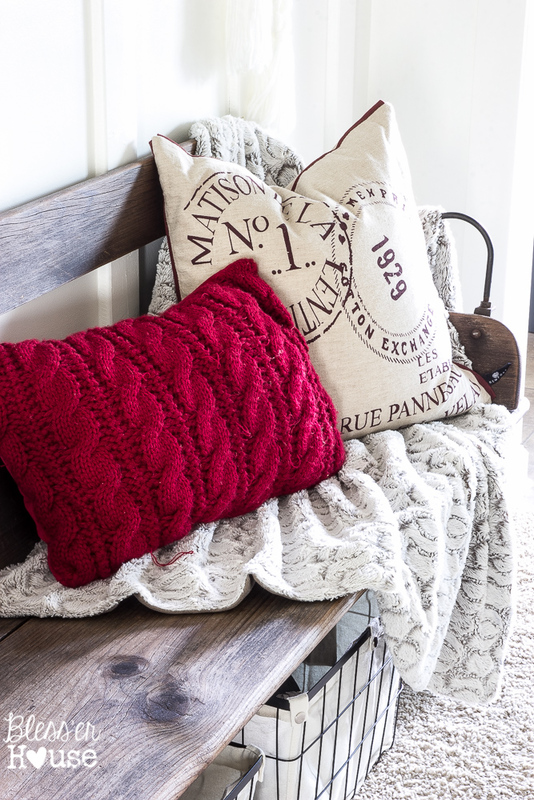 Lots of pillows on our sofas means lots of snuggles at our house. Basically, we’re couch potatoes. 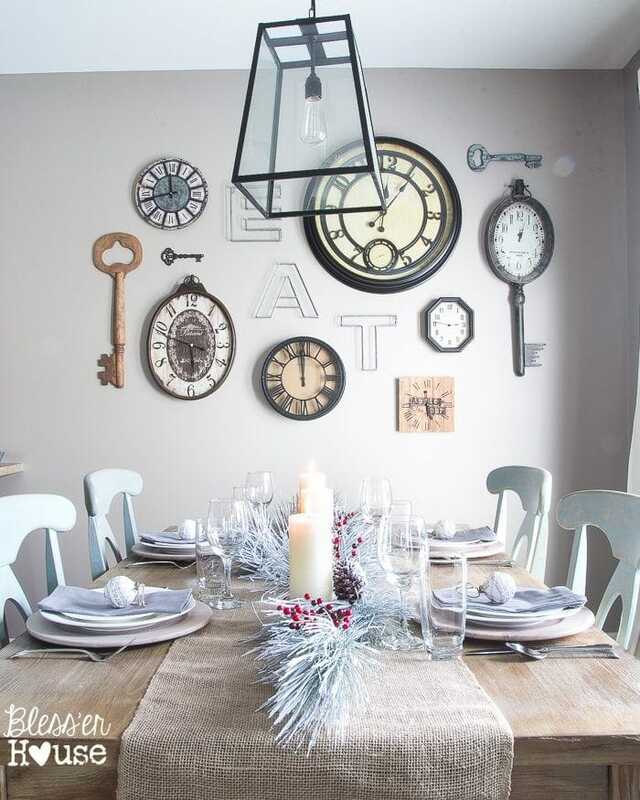 On into the kitchen is our breakfast table, where we eat pretty much every meal. 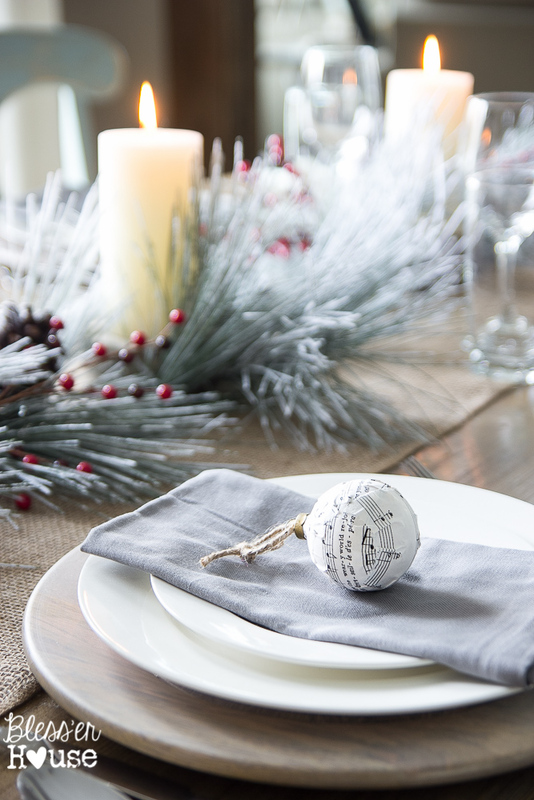 I kept it on the simple side with just a strand of garland and a few candles on a roll of burlap for our runner. I had a box of cheap glass ornaments and a stack of old sheet music laying around, so I went decoupage crazy on a few of them. I love using them everywhere! Upstairs in my daughter’s room, I ran with a Nutcracker theme. I couldn’t help myself. 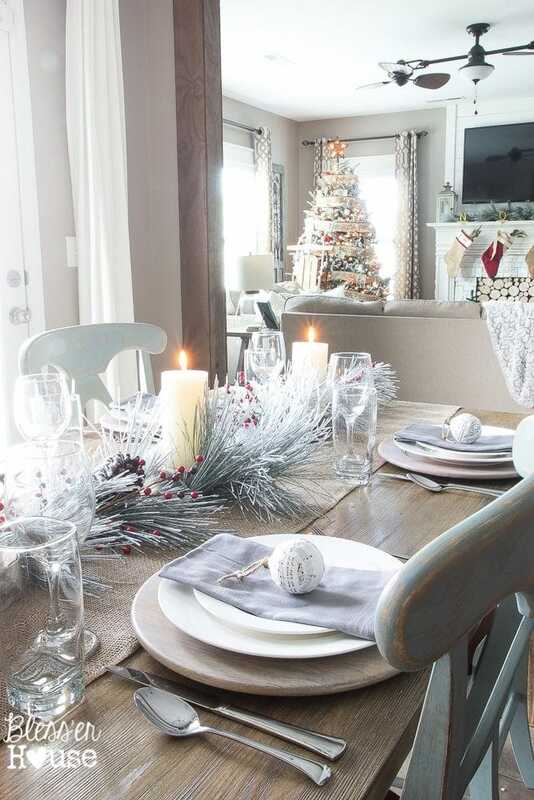 It was all just too cute with the ballet decor everywhere. 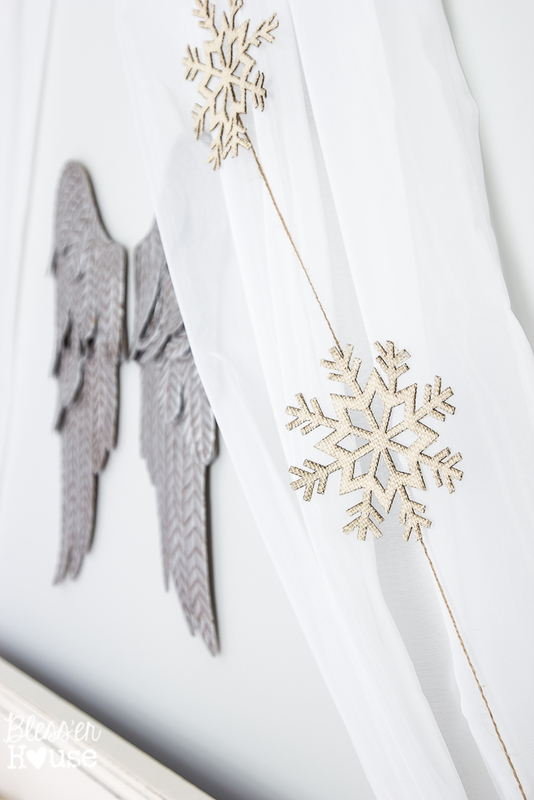 I found these burlap snowflakes in the Target Dollar Spot and strung them together for a little garland over her bed. 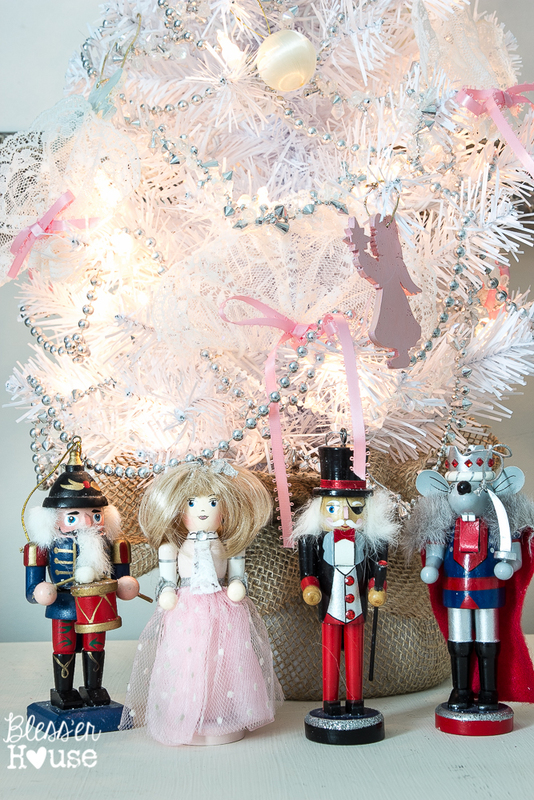 I set up a few Nutcracker dolls under her white mini tree too. 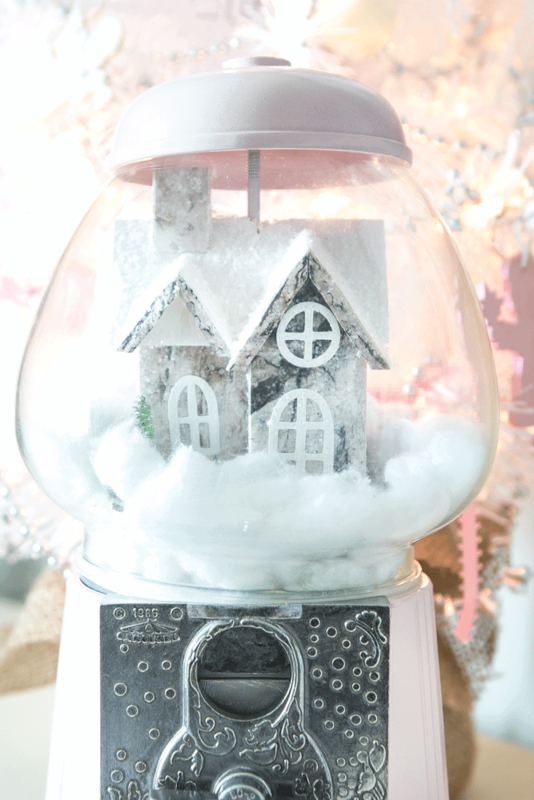 She and I had so much fun coming up with this gumball machine turned snow globe. I have a feeling it’ll stay even after the Christmas decorations are put away. It’s too stinkin’ cute! 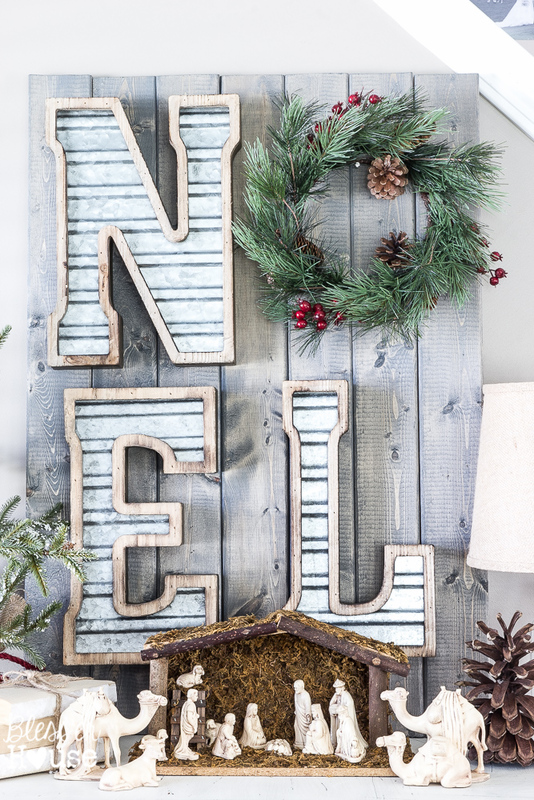 But back down in our living room is probably my favorite Christmas craft of all, this metal and wood noel sign. 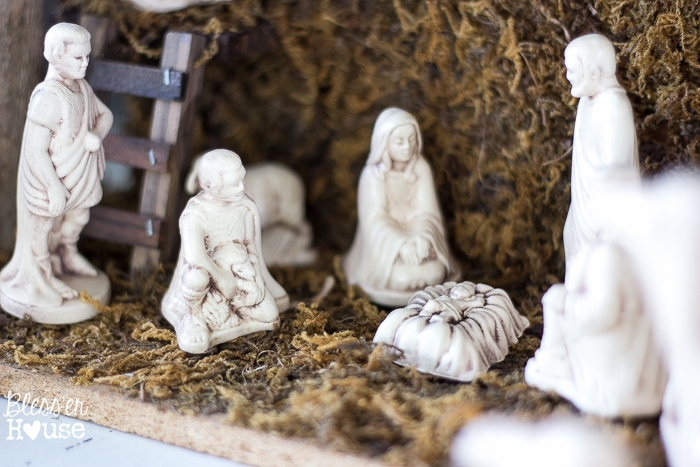 I hope for you this Christmas that it is perfect in so many ways. I hope you enjoy all of the little moments and don’t fret about money or that long to-do list. Instead, I hope you are surrounded by the people you love and that you take the time to celebrate what it is truly all about. Thank you so much for having a little visit with me today! And thank you, Beth, for having me! 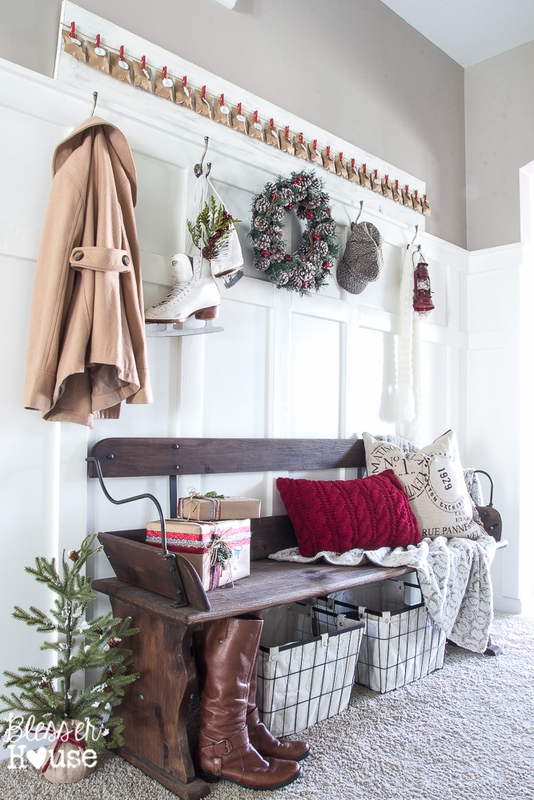 Loved the mud room and advent calendar. 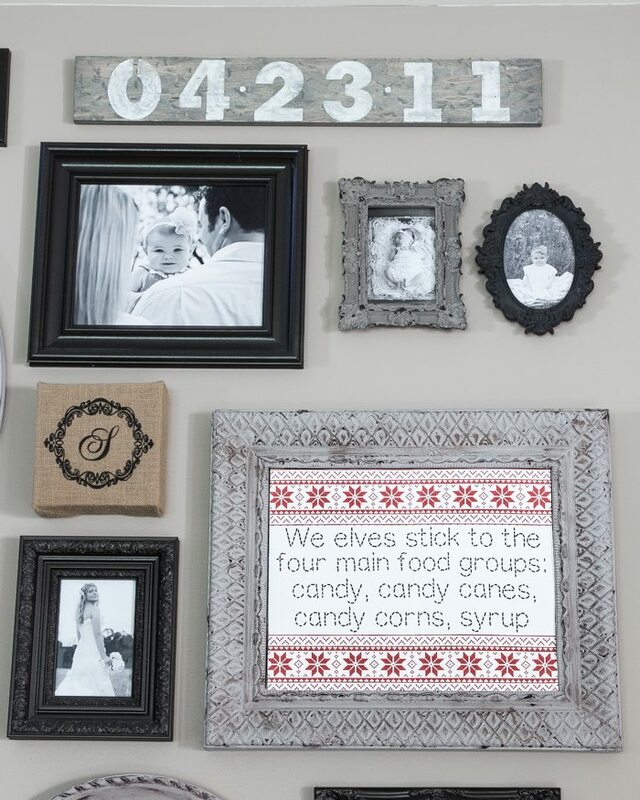 What a clever idea and it looks adorable too! 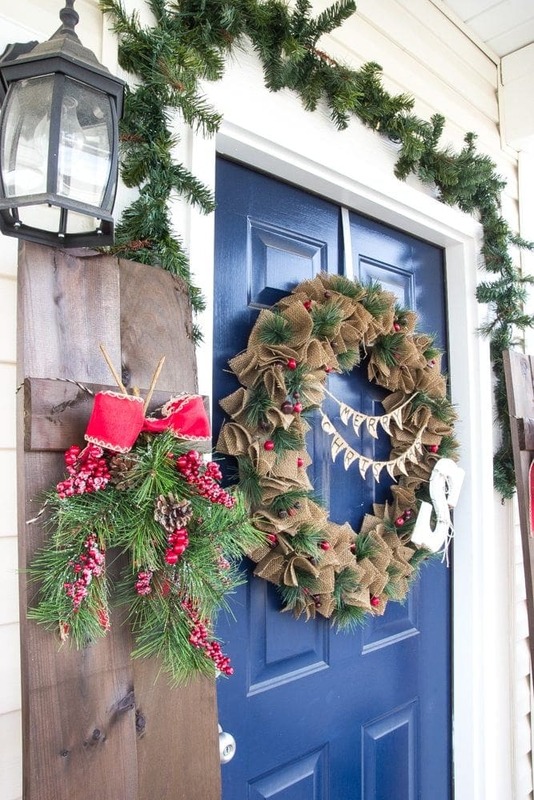 Thank you for sharing your house!